Why do I need a blood transfusion calculator? Which values do I need to estimate the blood transfusion volume for children? What's the formula for blood transfusion volume? 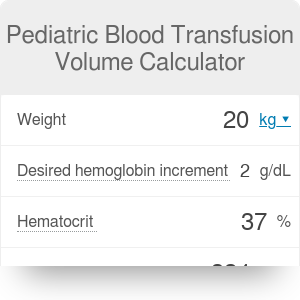 Our pediatric blood transfusion volume calculator uses a formula for blood transfusion volume described in an article titled Calculating the required transfusion volume in children written by Drs. Davies P, Robertson S, Hegde S, Greenwood R, Massey E, and Davis P from the Paediatric Intensive Care Unit, Bristol Royal Hospital for Children. This calculator estimates the volume of blood transfusion for children required to achieve the aimed hemoglobin increment. Estimating the blood transfusion volume for adult patients is very simple. One unit of packed red blood cells usually raises the hemoglobin concentration by 1 g/dl or hematocrit by 3%. This transfusion practice is imprecise, but it's widely recognized and applied. For children, though, it's understandable that a calculation is needed. Depending on their weight and age, their total blood volume can vary substantially. The pediatric transfusion volume of blood required for the hemoglobin increment of 1 g/dL administered to an infant is considerably lower than that needed for an adolescent. Remember to adjust the dosage of medicines for children. You can find our ibuprofen and paracetamol calculators useful. the desired increment in hemoglobin in g/dL. Hematocrit is the percentage of volume of red blood cells in blood, with normal value ranges 42-65% for neonates in the first month, 33-55% in the second month, 28-41% from third to sixth month, and 31-41% after the sixth month of life. For children between 1 and 5 years of age, the norm is 31-44%, and after the fifth birthday it's roughly 37-48% for males and 34-44% for females. The increment in hemoglobin is the difference between the patient's hemoglobin and the aimed level. Transfusion is usually used to maintain a blood hemoglobin concentration above 10 g/dL. Pediatric Blood Transfusion Volume Calculator can be embedded on your website to enrich the content you wrote and make it easier for your visitors to understand your message.